"Your name has been perpetuated in the Palestinian wedding songs"
He stood before the [Israeli] judge with his head held up high"
Family of murderer: "We are pleased with what he did"
"A crown on the heads of men"
The Palestinian murderer, Omar Al-Abd, who on July 21 this year slaughtered a grandfather and his two adult children, stabbing them to death while they were eating dinner in their home in Halamish near Ramallah, is being honored and praised by Palestinians. "Director of [PLO] Commission of Prisoners' Affairs Issa Karake mentioned the situation of the family members of wounded prisoner Omar Al-Abd... In a visit he paid to the family, together with a delegation from the [PLO] Commission of Prisoners' Affairs and the [PA-funded] Prisoners' Club, he said that [the family] constitutes a prominent example of the collective and arbitrary punishment by the occupation authorities." "The extremist settlers' entry to the Al-Aqsa Mosque is what is encouraging the violence, killing, terror, blood, and hatred, and creating an atmosphere that is appropriate for natural responses of equal value..."
"As for you, youth from Kubar, Omar Al-Abd - your name has been perpetuated in the Palestinian wedding songs, and we will build you and your family a home even if they destroy it a thousand times." "Did you hear the machine gun in the Arab [town of] Kubar? O Kubar, the town of the brave ones, your son, Omar, is a leader." Palestinian singer Muhammad Abu Taher Al-Barghouti was later arrested on charges of incitement by the Israeli army on Aug. 31, 2017 for this song honoring terrorist murderer Omar Al-Abd. "She [Ghannam] also noted that the only thing that our young people want is to live in dignity and freedom, and that what is happening at the Al-Aqsa Mosque and the occupation's harassment and targeting of everything that is Palestinian cause everyone [to have] feelings of rage. She added that peace and stability will not be obtained as long as our people is subjected to the most awful acts, and they are targeting our holy sites without any impediment or deterrence." 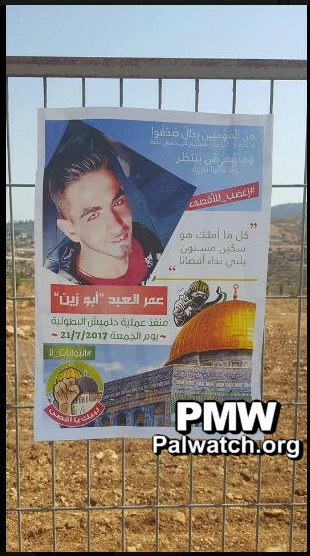 Ghannam also posted photos from the murderer's village, among them one of a poster with a photo of Omar Al-Abd, the Dome of the Rock with a drawing of a masked Arab rioter holding a slingshot and wearing the Palestinian flag, and a logo of a raised fist with the Al-Aqsa Mosque and the Dome of the Rock. #No_to_the_[metal_detector_]gates (refers to metal detectors placed by Israel at the entrances to the Temple Mount following a terror attack there on July 14, 2017, in which 2 Israelis were murdered; see note below.)" Text under logo in bottom left: "We are at your service, O Al-Aqsa Mosque"
This particular photo has since been removed from Ghannam's Facebook page. Palestinian Media Watch reported that no PA leader condemned the murders of the 3 Israelis. In contrast, a PA TV commentator even presented the murderer as compassionate for "refusing to harm" the children who were in the house, hidden by their mother. "Khalil Al-Abd - the uncle of Omar Al-Abd who carried out the stabbing operation that occurred in the Halamish settlement west of Ramallah during the Al-Aqsa Mosque events... said: 'We as a family are pleased with what Omar did, and we will accept everything that the occupation will carry out with patience.' He explained that the operation that Omar carried out was in response to the Israeli occupation's actions against the Palestinian people and the Al-Aqsa Mosque..."
You, the sons of apes and pigs (i.e., Jews in Islamic tradition, see note below) - if you do not open the gates of the Al-Aqsa Mosque, I am certain that after me will come a man who will strike [you] with an iron hand, I warn you! I know that I'm going there and I'll never come back here; rather I'll come back to Paradise, in the embrace of Allah's mercies. How good and pleasant is death and Martyrdom (Shahada) for Allah, His Messenger [Muhammad], and the place of His Messenger's Night Journey (i.e., the Al-Aqsa Mosque)!" A week earlier, a terror attack was carried out at the Temple Mount in which 2 Israeli border police officers were murdered by 3 Israeli Arab terrorists. Following the attack Israel closed the Temple Mount for two days and reopened it with metal detectors at the entrance to the holy site. Palestinians interpreted these measures as an "aggression" and "attack" against the Al-Aqsa Mosque. One of the "responses" was the murder of the 3 Israelis in Halamish by terrorist Al-Abd. 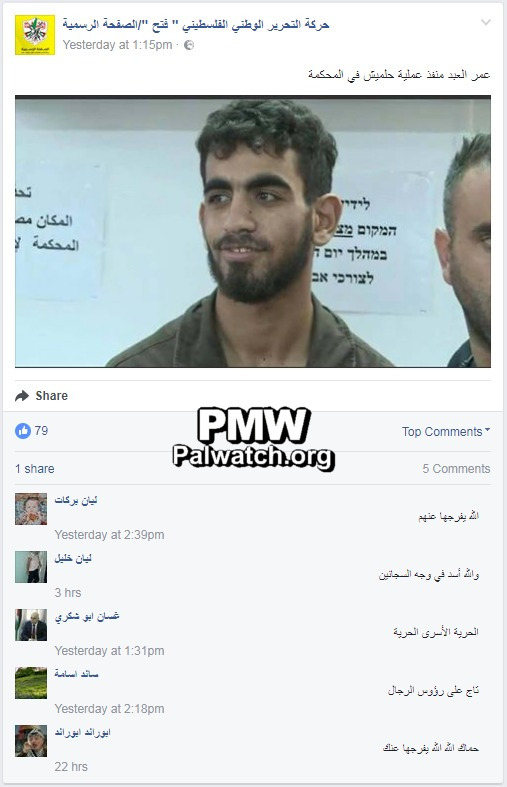 Posted text: "Omar Al-Abd, who carried out the Halamish operation in court"
"By Allah, [he is like] a lion facing the jailers"
"Freedom to the prisoners of freedom"
"May Allah protect you and release you"
Headline: "Mazen Al-Qaq: I will sue Ma'ariv for publishing a false quote of mine"
"Mazen Al-Qaq, who serves as chairman of the East Jerusalem Merchants' Association... condemned all of the lies attributed to him that were quoted on the website of the [Israeli] Ma'ariv newspaper... Al-Qaq said... that the quotes that were attributed to him regarding the Halamish operation (i.e., terror attack, 3 murdered) are false and untrue accusations, as the journalist did not ask him about the Halamish operation. Al-Qaq said that he would not have condemned it as the newspaper claimed." "Al-Qaq explained that he 'represents 6,000 residents in East Jerusalem, merchants and also civilians who live in the Old City.' In his words, beyond the situation at the Temple Mount and in the Old City, we see a family sitting together to eat on Friday evening (refers to terror attack in Halamish -Ed.). And [we] condemn that an Arab young man went in to that family and did what he did. 'He [the terrorist] is inhuman, he has no heart, and he is lawless, and that is certainly against Islam,' he emphasized. 'The Jerusalem residents condemn this, our heart aches over this, and I apologize from one human being to another to the family and to the people of Israel and the State of Israel.'" Headline: "The family of the person who carried out the Halamish operation: We are pleased with what he did, he did not hint that he would carry out the operation"
"Khalil Al-Abd - the uncle of Omar Al-Abd (i.e., terrorist, murdered 3) who carried out the stabbing operation that occurred in the Halamish settlement west of Ramallah during the Al-Aqsa Mosque events (refers to Israel's security steps at the Temple Mount following a terror attack there and ensuing Palestinian riots; see note below -Ed.) - said that [Omar] carried out the operation while understanding what he was doing. He added: 'It is natural that within a young Palestinian of his age, who follows and watches not only the occupation's actions against the Al-Aqsa Mosque but also against the whole Palestinian people, revolution and hatred of the occupation will grow, which led to what Omar carried out.'" Omar Al-Abd - 19-year-old Palestinian terrorist who stabbed and murdered 3 Israelis - Yosef, Haya, and Elad Salomon - and severely injured 1 - Tova Salomon - as they sat at their Sabbath dinner table in Halamish, north of Ramallah, on July 21, 2017. Al-Abd was shot and wounded by a neighbor and taken into Israeli custody, receiving necessary medical treatment in an Israeli hospital. Before committing the attack, Al-Abd wrote in his "will" on Facebook that he was taking his knife to respond to what was happening at the Al-Aqsa Mosque and did not expect to return. A week earlier, a terror attack was carried out at the Temple Mount in which 2 Israelis were murdered. Following the attack Israel closed the Temple Mount for two days and reopened it with metal detectors at the entrance to the holy site. Palestinians interpreted these measures as an "aggression" and "attack" against the Al-Aqsa Mosque. The mention of "the Al-Aqsa Mosque events" refers to Israeli security measures at the Temple Mount, including metal detectors at the entrances, following an attack there on July 14, 2017, in which 2 Israeli border police officers were murdered by 3 Israeli Arab terrorists. On July 24, 2017, Israel decided to remove the metal detectors and security cameras it had placed at the site. The PA continued to demand that all measures including inspections at the entrances be removed, and Palestinians continued to riot. On July 27, 2017, PA religious leaders declared that all Israeli measures had been removed. Posted text: "The Al-Aqsa Mosque is 144 dunams (i.e., approximately 35.6 acres) to which the occupation state has no political, religious, human, or moral right. The extremist settlers' entry to the Al-Aqsa Mosque is what is encouraging the violence, killing, terror, blood, and hatred, and creating an atmosphere that is appropriate for natural responses of equal value (apparently refers to a terror attack that took place a day before the post, in which 3 Israelis were murdered; see note below -Ed. ), and not a single one of the Palestinians who are defending the principle of their faith and their homeland. The myth of the alleged Temple has been refuted by all of the excavations and archaeologists, even the Jews among them (sic., ample archaeological evidence has proven the existence of the First and Second Temples). After dozens of excavations under the foundations of the Al-Aqsa Mosque, they have not found a single [piece of] evidence for this lie. The occupation's soldiers or its [metal detector] gates do not protect the Al-Aqsa Mosque (refers to metal detectors placed at the entrances to the Temple Mount following a terror attack there on July 14, 2017, in which 2 Israelis were murdered; see note below -Ed.). [The Al-Aqsa Mosque's] scholars, its young people, its women, and those carrying out Ribat (i.e., religious conflict/war over land claimed to be Islamic) at its holy gates are the ones protecting it." Karake mentioned the situation of the family members of wounded prisoner Omar Al-Abd (i.e., terrorist, murdered 3), residents of the village of Kubar in the Ramallah sub-district. In a visit he paid to the family, together with a delegation from the [PLO] Commission of Prisoners' Affairs and the [PA-funded] Prisoners' Club, he said that [the family] constitutes a prominent example of the collective and arbitrary punishment by the occupation authorities. It should be noted that after Omar was arrested and wounded, the occupation forces destroyed the house and expropriated the land that it was built on. They also arrested his three brothers, Khaled, Munir, and Omar (sic), his mother Ibtisam, his father Abd Al-Jalil, and their uncle Ibrahim (the terrorist's relatives were arrested based on information that they knew of the attack in advance and did not stop it, and for incitement in celebrating it afterwards -Ed.)." Headline: "During his visit with families of prisoners and released prisoners on the eve of Eid Al-Adha - Karake: 6,500 prisoners are sitting in the prisons, the [number of] arrests since the beginning of the year is unprecedented"
The visits included... the mother of wounded prisoner Omar Al-Abd (i.e., terrorist, murdered 3), a resident of Kubar in the Ramallah district. Karake rejected the pressures and racist incitement against the prisoners and Martyrs (Shahids) from the occupation government. He said that they are victims of the occupation, and that their struggle is a legal struggle that has been approved by all of the international conventions and agreements. He added that the occupation is an illegal entity that perpetrates organized crime against the Palestinian people." Headline: "[The village of] Kubar produces glory"
"The village of Kubar is producing its glory today through resolve, challenge, and confrontation. Kubar has known no sleep or rest for nearly a week. 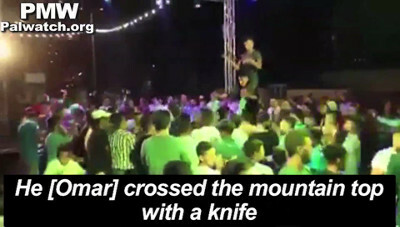 This is because after young Omar Al-Abd (i.e., terrorist, murdered 3) felt a strong rage over what is happening at the Al-Aqsa Mosque and in Jerusalem (refers to metal detectors placed at the Temple Mount after a terror attack there on July 14, 2017, in which 2 Israelis were murdered; see note below. Israel decided to remove the detectors on July 24, 2017 -Ed.) and carried out an operation at the settlement of Halamish on Friday, July 21, , the village and its residents have been subjected to the most awful Israeli collective punishments." Headline: "Your home is a high castle in the gardens of Palestinian memory"
"The first news item that I read yesterday morning (Wednesday) [Aug. 16, 2017] was that the Israeli occupation forces destroyed the home of the family of Omar Al-Abd (i.e., terrorist, murdered 3), who carried out the operation (i.e., terror attack) in the Halamish settlement, which is in (sic., near) the village of Kubar in the Ramallah sub-district. The objective of this operation was 3 settlers, thieves of the Palestinian land, in response to the death of Martyrs (Shahids) at the Al-Aqsa Mosque plazas who were shot by the Israeli occupation soldiers (refers to three terrorists who murdered 2 Israelis on the Temple Mount; see note below -Ed.). We the Palestinians oppose murder, because we are its first victim. I remember [from] when I was a small child massacres that were carried out by [Ariel] Sharon, who was commander of [Commando] Unit 101 (i.e., a special cross-border counter-terror unit in the early years of the state), including the massacre of tuberculosis patients at the hospital for tuberculosis patients (sic., there is no evidence for this claim) in the east of the Bureij refugee camp in the central Gaza Strip (refers to an incident in August 1953 when Egypt occupied Gaza, in which the unit came under fire on a mission and ended up killing 43 civilians at the camp -Ed.). When terror reigns supreme in the State of Israel, what do they expect? Their crimes of murder are directed towards Palestinians because they are Palestinians, while we hate the occupation because it is an occupation." Muhammad Ahmad Muhammad Jabarin, Muhammad Hamed Abd Al-Latif Jabarin, and Muhammad Ahmad Mufaddal Jabarin - Israeli Arab terrorists aged 29, 19, and 19, who shot from the Temple Mount at Israeli policemen, murdering 2 Israeli Druze border policemen - Haiel Stawi and Kamil Shnaan, on July 14, 2017. Two of the terrorists were shot and killed by other policemen during the attack. 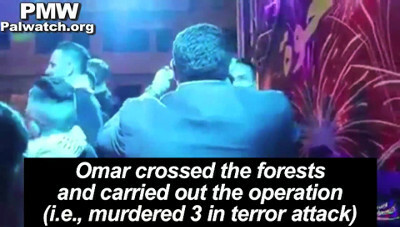 The third terrorist was shot and killed while trying to flee. Muhammad Abu Khdeir - Palestinian teen kidnapped and murdered by Israeli extremists in Jerusalem on July 2, 2014, in revenge for the kidnapping and murder of Israeli teens Eyal Yifrach, Gilad Shaar and Naftali Fraenkel in the West Bank on June 12. Following Abu Khdeir's murder, Palestinians took to the streets of East Jerusalem in violent and continuous protests. Prime Minister Benjamin Netanyahu and other Israeli ministers immediately condemned the revenge murder in the strongest terms. Israeli police arrested six Israeli suspects on July 6 of whom three confessed to murdering Khdeir. One of the murderers, Yosef Ben-David, is serving 1 life sentence and an additional 20 years. His two accomplices, both unnamed minors, are serving 1 life sentence and 21 years respectively. Duma arson attack - On July 31, 2015, two Palestinian houses in the West Bank village of Duma were set afire by Molotov cocktails thrown through their windows. 18-month-old Ali Dawabsheh was murdered in this attack, as was his father, Saad Dawabsheh and mother, Reham Dawabsheh, who both died of their injuries later. The only survivor of the attack was the couple's other son, 4-year-old Ahmad, who suffered burns on 60% of his body and was treated in Israel. Israeli leaders and citizens from all sectors of society condemned this attack, and Israeli Prime Minister Benjamin Netanyahu told PA Chairman Mahmoud Abbas that all Israelis were disgusted by the crime, adding, "We will not countenance terrorism of any kind." He ordered the security forces "to use all means at their disposal to apprehend the murderers and bring them to justice forthwith." Israeli Police has treated the attack as a nationalistic crime carried out by Jewish extremists in revenge for Palestinian terror attacks. 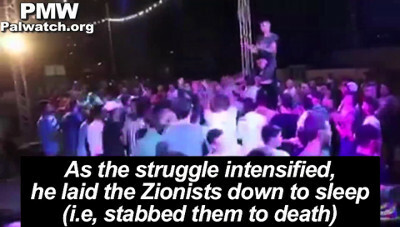 In early December 2015, Israeli police arrested several Jewish extremists who were believed to have been involved in the attack, and in January 2016, Israel indicted 21-year-old Amiram Ben Uliel, a member of the radical Jewish group "Hilltop Youth," with three counts of murder, attempted murder, arson and conspiracy to commit a nationalistically-motivated crime. Ben Uliel confessed to police that he carried out the attack in revenge for the murder of Malachi Rosenfeld, an Israeli who was shot and murdered in a terror attack in the West Bank. Ben Uliel's defense has claimed that his confession was made under torture and suspicions have been raised that the arson and three other subsequent arson attacks against other Dawabshe family members are part of a family feud. Ben Uliel's trial is still pending. A minor whose name remains under a police gag order was also charged. Abd Al-Fattah Al-Sharif - 21-year-old Palestinian terrorist who, together with an accomplice, 21-year-old terrorist Ramzi Aziz Al-Qasrawi, stabbed and injured Israeli soldiers on March 24, 2016, in Hebron. The accomplice was shot and killed by Israeli soldiers and Al-Sharif was shot and wounded. Then, while lying on the ground, Al-Sharif was shot in the head and killed by another Israeli soldier, Elor Azaria. The shooting was condemned by some Israeli officials as unnecessary use of force and defended by others as justified out of fear the terrorist was wearing an explosives belt. Azaria was convicted of manslaughter in January 2017 and sentenced to 18 months in prison. Azaria appealed the conviction, but his appeal was rejected by a military court of appeals on July 30, 2017. Text in post and on poster: "Jerusalem will win thanks to them"
The remaining pictures show the metal detectors placed at the entrances to the Temple Mount following a terror attack that took place there on July 14, 2017, in which 2 Israelis were murdered - see note below. Israel decided to remove the metal detectors on July 24, 2017. The remaining pictures show riots and demonstrations that took place following the placement of the metal detectors. Muhammad Lafi (18), Muhammad Hassan Abu Ghannam (in his 20s), and Muhammad Sharaf (17) - three Arab rioters who were killed by Israeli soldiers on July 21, 2017, while participating in separate confrontations with the Israeli army in Jerusalem and around it. The riots were held in protest of Israel placing metal detectors at the entrance to the Temple Mount following a terror attack there on July 14, 2017, in which 2 Israelis were murdered. Muhammad Tanouh - a Palestinian terrorist who tried to stab Israeli soldiers at the entrance to the village of Taqua, south of Bethlehem, on July 20, 2017, and was shot and killed by them. Al-Barghouti's arrest was preceded by 'a huge amount' of incitement and racism by the Israeli leaders, which led in recent months and even before that to the cancellation of freedoms, killing, abuse, settlement, Judaization, and demolitions, in blatant violation of human morals and standards. The occupation soldiers did not stop at arresting Al-Barghouti, but seized the storage drives of songs from his performances and hit his father, who was hospitalized as a result in the governmental hospital in Salfit. O Kubar, the town of the brave ones, your son, Omar, is a leader. And before him, leader Marwan [Barghouti] (i.e., terrorist who orchestrated three shooting attacks in which 5 were murdered)"
The occupation state - which has a record packed full of assassinations, especially against politicians, artists, writers, and authors - has already closed Palestinian radio stations and news channels on the pretext of incitement in the past. The Israeli Ministry of Education also persecutes Palestinian teachers in the schools in occupied Jerusalem and the 1948 territories (i.e., Israel). Recently it took steps against 12 Palestinian teachers, including dismissal and suspension, due to 'incitement.' This is in addition to many steps that [Israeli Prime Minister Benjamin] Netanyahu's government is marketing as legal justification for violating the Palestinian rights and silencing people." Marwan Barghouti - Palestinian terrorist who is serving 5 life sentences for orchestrating three shooting attacks that murdered 5 people: one attack in Jerusalem (June 12, 2001) in which Greek monk Tsibouktsakis Germanus was murdered by terrorist Ismail Radaida and another unidentified terrorist, another attack at a gas station in Givat Zeev near Jerusalem (Jan. 15, 2002) in which Yoela Hen, 45, was murdered by terrorists led by Mohammed Matla, and one shooting and stabbing attack at the Seafood Market restaurant in Tel Aviv (March 5, 2002) in which Eli Dahan, 53, Yosef Habi, 52, and Police Officer Sergeant-Major Salim Barakat, 33, were murdered by terrorist Ibrahim Hasouna. When arrested by Israel in 2002, Barghouti headed the Tanzim (Fatah terror faction). After he was convicted and imprisoned, he was re-elected member of the Palestinian Authority parliament. 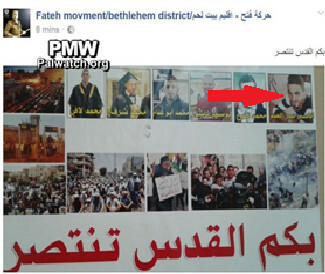 On Dec. 4, 2016, he was elected to Fatah's Central Committee. "[Arab] Jerusalem resident Mazen Al-Qaq, who serves as chairman of the East Jerusalem Merchants' Association, ... condemned all of the lies attributed to him that were quoted on the website of the [Israeli] Ma'ariv newspaper. Regarding the other operations, Al-Qaq said that he did not refer to them at all, and that the quotes that were attributed to him regarding the Halamish operation (i.e., terror attack, 3 murdered) are false and untrue accusations, as the journalist did not ask him about the Halamish operation. 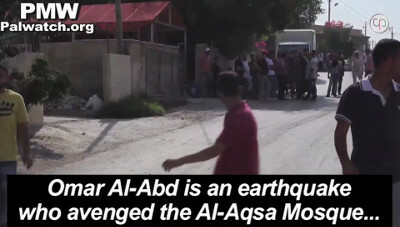 Al-Qaq said that he would not have condemned it as the newspaper claimed. He emphasized that he has turned to the Israeli legal system in order to sue the newspaper for quoting things he did not say, and that the conversation between him and the Israeli newspaper's journalist was recorded on his personal telephone. During a visit he made to [the independent Palestinian news agency] Ma'an in order to clarify the things that were attributed to him and which have harmed him, his family, and his reputation, Al-Qaq said... that try as it might, the Hebrew press will not harm his determination to serve the residents of his city, East Jerusalem, but rather will only increase it." The article mentioned, which appeared in Ma'ariv on July 23, 2017, reads: "Al-Qaq explained that he 'represents 6,000 residents in East Jerusalem, merchants and also civilians who live in the Old City.' In his words, beyond the situation at the Temple Mount and in the Old City, we see a family sitting together to eat on Friday evening (refers to terror attack in Halamish -Ed.). And [we] condemn that an Arab young man went in to that family and did what he did. 'He [the terrorist] is inhuman, he has no heart, and he is lawless, and that is certainly against Islam,' he emphasized. 'The Jerusalem residents condemn this, our heart aches over this, and I apologize from one human being to another to the family and to the people of Israel and the State of Israel.'" Headline: "The will of Martyr Omar Al-Abd (i.e., terrorist, murdered 3), who carried out the stabbing operation next to Ramallah"
A blessing and peace will come to the most honored of mankind, the Prophet who was sent [by Allah], our master Muhammad. Read my will, which is also my last words to you. I'm a young person whose age does not exceed 20. I have many dreams and aspirations. In the past I knew that with the help of Allah my dreams would come true. I loved life [and wanted] to sketch a smile on people's faces. But what sort of life is this? A life in which our women are murdered and our young people are abused, and they defile our Al-Aqsa Mosque, the place of our beloved [Prophet Muhammad's] Night Journey, while we are asleep. Isn't it a disgrace for us to sit idle? You whose weapons are covered with rust, you who only take out your weapons for display - aren't you ashamed of yourselves? They've declared war on Allah. Isn't Allah deserving of you making efforts for Him? They closed the Al-Aqsa Mosque (refers to Israel closing the Temple Mount for two days and placing metal detectors at its entrances following a terror attack there on July 14, 2017, in which 2 Israelis were murdered; see note below -Ed. ), and your weapon did not respond to the call! All that is in my hands is a sharpened knife, and it answers the call of the Al-Aqsa Mosque. Be ashamed to show your face! Be ashamed, you who arouse strife (i.e., the Hamas-Fatah rift) among us! Allah will take revenge on you and you will give an accounting before Allah! It is enough that we are all sons of Palestine and sons of the Al-Aqsa Mosque. You, the sons of apes and pigs (i.e., the Jews, see note below) - if you do not open the gates of the Al-Aqsa Mosque, I am certain that after me will come a man who will strike [you] with an iron hand, I warn you! I know that I'm going there and I'll never come back here; rather I'll come back to Paradise, in the embrace of Allah's mercies. How good and pleasant is death and Martyrdom (Shahada) for Allah, His Messenger [Muhammad], and the place of His Messenger's Night Journey (i.e., the Al-Aqsa Mosque)! I ask you, forgive me, as my breaths are already numbered. Forgive me, my father, my mother, and my siblings; you will suffer in the future because of me! Forgive me, as I am going to Paradise. My home is there, and there I will drink from the rivers of Paradise from the hands of the Leader of Mankind [Allah]! 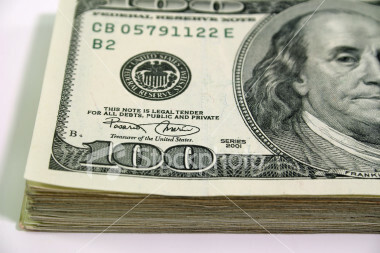 I want nothing more than this, therefore forgive me! I convey my will, and I will demand an accounting before Allah of anyone who does not uphold it. You Muslims - my family is all of your responsibility. Wrap [my body] in the flag of Allah's Messenger, cover my head with the headdress of [Izz A-Din] Al-Qassam (i.e., a terrorist from the British Mandate period who serves as a symbol of Hamas), wrap my chest with the cloak of Yasser Arafat, and put them in the grave with me. I say my words with a sound mind, and yearn to meet Allah. I ask you not to eulogize me, and do not sing songs - just remember me and ask for mercy upon me. I ask you to unite, as we are all one, our blood is one, our enemies are one, and our Al-Aqsa Mosque is one; why are there foolish rifts between us?" In three instances (Suras 2:65, 5:60, and 7:166), the Quran tells of Allah turning Jews into apes and/or pigs. Sura 2:65 "And you had already known about those who transgressed among you concerning the sabbath, and We said to them, 'Be apes, despised.'" Sura 7:166 "So when they were insolent about that which they had been forbidden, We said to them, 'Be apes, despised.'" Sura 5:60 "Say, 'Shall I inform you of [what is] worse than that as penalty from Allah? [It is that of] those (i.e., the Jews) whom Allah has cursed and with whom He became angry and made of them apes and pigs and slaves of Taghut. Those are worse in position and further astray from the sound way.'" Sheikh Izz A-Din Al-Qassam was an influential Islamic preacher in British Mandate Palestine during the 1930s. He led a Muslim terror group. The Hamas terror wing is named after him - the Izz A-Din Al-Qassam Brigades.